This is the fifth and final post in the series on “How to be an Educated Consumer of Online Information.” I can hear you cheering now. I realize that this series may have seemed like I’ve veered off on a tangent. After all, what does any of this have to do with IT and cybersecurity? As I pointed out in the previous post on social media, malware can take other forms besides what we’re accustomed. Misinformation and disinformation are on the rise and the net effect on society is just as detrimental as the impact from a virus. Though the focus of this post is navigating online news sites, the identified threat extends to all forms of media and communication. It also even extends beyond politics and current events. News and updates pertaining to technological and cybersecurity issues are also potential attack surfaces. Much has occurred on this front since I began this series prior to the inauguration of the 45th president of the United States. To reiterate, I’m trying mightily to keep politics and my personal viewpoints out of these posts. The goal is to hopefully provide you with a few small takeaways for successfully navigating and consuming the torrent of information you encounter online on a daily basis, minute-by-minute. Unfortunately, political motivation is behind much of the assault the truth has come under lately. If it’s any consolation, it originates from both the left and the right. That’s why it’s as important as ever to take the time and effort to go the extra distance and fact check just about everything you encounter online. The traps and pitfalls are abundant and becoming ensnared in them can be costly. The advance of technology, especially the internet, has greatly improved our lives, but at the expense of traditional industries such as department stores, small mom and pops, and “dead tree” newspapers. The casualties in the latter category are numerous. Before the proliferation of online news sites, many cities, Washington, DC included, had two daily newspapers. DC had the Washington Post on sale at newsstands as the city was waking up and the Evening Star for commuters to read on the bus on their way home. There weren’t the constant updates on social media and everywhere else online, so people settled for getting their news at a more leisurely pace. Breaking news stories came in over the radio or on TV. Many times someone would poke their head in your office and ask if you heard the latest. I learned about the Challenger disaster while waiting for a table at lunch. The tiny TV in the lobby was replaying the horrible events of that day. There were no smartphones to alert us about what happened. Newspapers have struggled to remain profitable in a new world where consumers expect everything from software to movies and music to news and information to be free. Paper subscriptions are way down and the cost to grind up all those dead trees into pulp to print the news on makes for a losing business model. 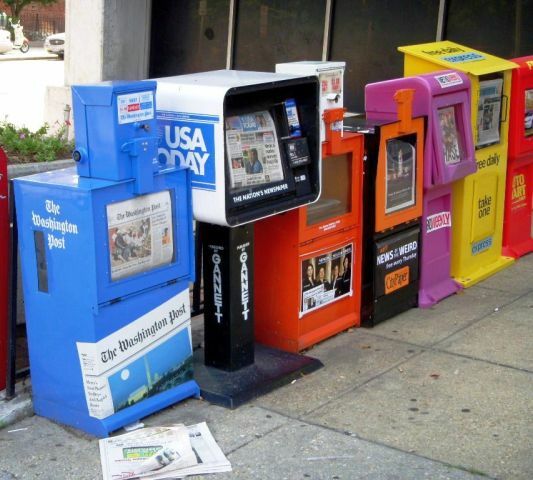 Many newspapers have resorted to a paywall model such as the NYT, WSJ, and the Washington Post. The Post, now owned by a holding company controlled by Jeff Bezos of Amazon fame, has pushed things further will its online advertising formats and even monetizing its own links to products Amazon, mainly in the form of books. The general quality of journalism these days is bemoaned in many quarters. I have to admit that basic proofreading and editing seems to have gone by the wayside. The quality of the actual journalism to my mind varies considerably. I think the important point is to evaluate an online newspaper by its relative quality and political leaning. Newspapers such as The Washington Post, The New York Times, and Wall Street Journal are generally considered to be elite papers; however, the former two have a decidedly liberal bent whereas the latter is solidly conservative. It may take an extreme effort, but gaining a different perspective on political and world news even if you completely disagree with the opposing viewpoint is not a bad practice. At least you’ll know what you’re in for when it comes to talking points when engaging in debates with the “opposition” in your life – both in-person and online. Despite even people in high places falling into this trap, it’s one we all need to resist vigorously. Prior to the internet, if something was published in a book or newspaper, people generally took it as gospel. At least, the barrier to entry for getting something in print is quite a bit higher than for publishing something online. Today, anyone can create a blog or even a website purporting to be a legitimate news site. There have been several examples of such sites hosting “fake news” during the recently concluded presidential election. But these kinds of sites have been around a lot longer. Raise your hand if you’ve ever received an email or saw a post on Facebook warning you about a particular health danger or how criminals are being coddled with luxury accommodations in a new jail facility in Cook County, IL. You may even have a “favorite” friend or relative who relishes forwarding you emails with such stories. These types of stories are pretty easy to spot once you’ve investigated a few. As mentioned in the post on “Become an Expert on any Subject” a useful source of additional insight can often be found in the comments sections of online articles. There have always been trolls using fake accounts. They seem to exist solely for their own gratification in getting a rise out of others with their provocations. However, another disturbing trend has emerged from the recent presidential election: paid trolls. Many of these trolls have been tracked back to Russia. I’ve noticed quite a bit of commenters that fit the description of paid trolls on a news site I frequent. Whether they reside in Moscow or down the street, the net effect is to pollute and dilute the quality of what was once a forum for entertaining and insightful discussion. Continuing the malware analogy, it’s the equivalent of a DDoS attack in its effect to substantially throttle back the flow of useful information and rewarding social transactions. Before we return to our regularly scheduled program of technology and cybersecurity discussions, which I eagerly await, it’s worth taking a moment to review some key points from this series. The birth of the Internet and WWW has presented us with a wealth of resources. Having come of age prior to this medium, I still haven’t reached the point of taking it for granted. Flashbacks to using the public library for research papers are enough to make me fall to my knees and express my infinite gratitude. At the same time, I fear that this great resource is under attack and also being abused, though often unintentionally, by those that don’t question everything they read. We all have a responsibility to act as filters for the information that flows to us like water from a fire hose. Things now move at an insane pace, but we should resist the temptation to attempt to keep up with it. Sometimes slowing down and taking a step back to contemplate and verify will serve all of us better. A crowd-sourced BS detector might be the direction we need to head.